Spider-Man: Homecoming is the latest Spider-Man movie, this time it’s directed by Jon Watts with a screenplay by Jonathan Goldstein and Francis Daley, Watts and Christopher Ford, and Chris McKenna and Erik Sommers. 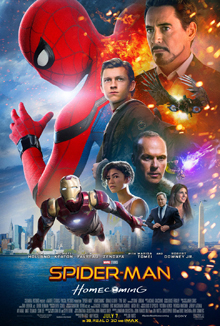 The film stars Tom Holland (reprising his role from Captain America: Civil War), Michael Keaton, Jon Favreau, Zendaya, Donald Glover, Tyne Daly, Maris Tomei and Robert Downey Jr. This entry was posted in Comics, Reviews and tagged Chris McKenna, Christopher Ford, comics, donald glover, Erik Sommers, Francis Daley, Hannibal Buress, jon favreau, Jon Watts, Jonathan Goldstein, Marisa Tomei, marvel, Marvel Comics, Michael Keaton, movie review, Robert Downey Jr., Shocker, spider-man, Spider-Man Homecoming, Spider-Man review, Tom Holland, Tyne Daly, Vulture, Zendaya on July 10, 2017 by Eugene.